Scholars GeoPortal contains both licensed and non-licensed (open) data. In order to access the licensed data, you will need to log in through your university. By logging in, you can save your maps, annotations, and other activities, and view them later. Depending on the university you are affiliated with, use one of the options below. Using this method will sign you in to access licensed resources plus the features of the My GeoPortal user account in a single step. Select your institution from the list and sign in with your university credentials when prompted. If you do not belong to one of these institutions you can still access Scholars GeoPortal from off-campus. Instead, when you access Scholars GeoPortal, on the map view you will encounter a prompt to login. Select your institution and follow the instructions. If you want to save your maps, you will need to create an account by clicking the Login tab and selecting your desired login method (Google, Yahoo, Facebook, Twitter, or OpenID). Select how you want to search. In the GeoPortal, you can search based on the “Data”, or you can search for data about a specific geographic location by using “Place or address”. Place names come from the Canadian Geographic Names Service and from an Esri-hosted address service (often used for geocoding). The GeoPortal accesses a comprehensive place name listing for Canada (the Canadian Geographic Names Database). 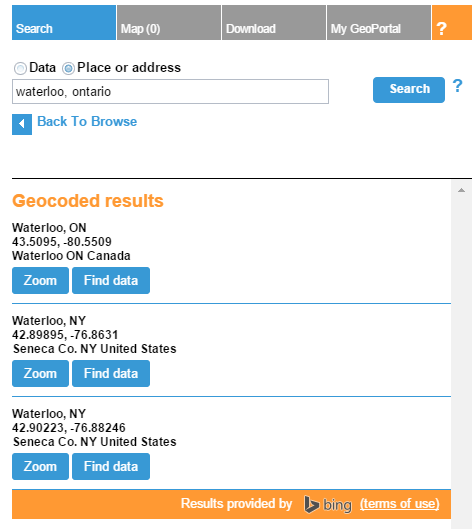 For locations outside of Canada, ESRI’s geocoding service can identify major landmarks like cities and large lakes, but not the detailed geographic features that are available for Canada. Enter your search term into the text box. For the “Data” search, you can search more than one word or phrase by clicking the “+” symbol to the right of the text box. If you are doing a “Data” search, select where you would like to search. “Anywhere” search looks for your search term anywhere in the metadata record. You can also restrict your search to the dataset’s Keywords, Title, Abstract, or Series. Select “Include Area” to draw an area on the map that you would like to search for data within. Select the “Date Range” to find data from a specific point in time. By default, the GeoPortal will search for content that you are able to download through your institution; to see all of the data in the GeoPortal, uncheck this box. If you did a “Data” search, you can use the Refine options to the left of your search results, read more about it by clicking Details, or add the data to your map by clicking Add. If the button says “Access Resource”, then that means that this dataset is only available for download through your institution, and can’t be used inside of the GeoPortal. If the button says “Download”, then that means that you have to download the dataset and access it within an external GIS software package. If you did a “Place or address” search, click Zoom to go to that area on the map, or Find Data to get data about that location. Boolean Search: Use the operators AND, OR, and NOT between words to create more complex queries. Using parentheses within a search box to enforce order of operations will not work in the GeoPortal; instead, place each of your search terms onto a different line. Phrase Search: Surround phrases in quotation marks to search for the entire phrase. Wildcard: Use a * or ? to expand your search to include all words that begin with the letters you type. ? matches exactly one character, while * matches any number of characters. For example, searching for he? will match only words like hem and hen, while searching for he* will match terms like he, hem, help, and hello. Stemmed Search: The system automatically performs a “stemmed search”, which searches for all words with the stem you typed. This is based on word meaning, not spelling. For example, searching for running will automatically return run, running, and ran. Note that if you use a wildcard, word stemming no longer occurs. If you do not want word stemming to occur, use a phrase search. Instead of searching, you can also browse the data in the GeoPortal by Subject categories, Keywords, Producers, or New Data Layers. For example, if you wanted to learn more about the street network, you could click on the Subject Category “Transportation” or the Keyword “Roads”. Subject categories are a pre-determined set of 19 broad subject areas. See the list on the left column of this page for more information about these categories. After selecting a browse option, you will see a list of available data, including a brief description of the data as well as the full metadata record (Details). At the bottom of the Details box, be sure to look for any Additional Documentation about the data set. Once you have found data you are interested in and added them to your map, you can view all of your added data by clicking the Map tab. The number in parentheses indicates the total number of layers you have added to the map. View the cartographic symbols associated with the layer. Use the Remove button to delete the data layer from your map and Data Layers list. If you would like to hide the layer but keep it in your list, click the check box beside the title of the layer. Use the Zoom button to zoom to the full geographic region covered by the data layer. View more details (metadata) about that data layer by clicking Details. At the bottom of the Details window, you will see any Additional Documentation. Often this documentation provides a wealth of valuable detail about the data contents. Move your layers to change the order they are drawn on the map and listed in the data layers list by dragging the layer. Generally, data layers that are represented as points or lines should be at the top, and imagery and polygon layers (such as land use) should be at the bottom. This will ensure all layers are visible at once. Use the slider bar on the right to change the transparency of a layer. You have additional zooming and navigation tools in the upper left corner of your map display. You can use the slider to zoom in and out on the map, the full extent button to return to the full view of the map, and the selection button to draw a box on the map to zoom to. To pan or move around the map, click on the map and drag the mouse. On your map, you can click on a feature on the map to display additional information about that data layer. By clicking Data Table in the upper right menu, you can view the underlying data that is associated with your map. From here, you can explore the records in the data table, and click on a record to zoom to it on the map. Clicking the checkbox for “limit to current extent” will only show records that fall within the area of the map that you are viewing. Now, you can either:Select a pre-defined area: The pre-defined area boundaries available are Provinces and Territories, Census Metropolitan Areas (CMA), Census Divisions (CD), Census Subdivisions (CSD) and Census Tracts (CT). Choose the boundary type you would like to select in the list, then click on the map in the area you would like to select. The selected area will be highlighted in yellow. To de-select the area, click it again. You can select multiple areas by clicking additional areas of the map.Draw an area: If you would like to further customize your download area, you can draw your own. To be more precise, start by zooming into the area that you want to download on the map. Then, select one of the draw tools, which include the Polygon, Freehand, or Rectangle. Draw your shape on the map. When you’re finished drawing, you will see a yellow shape on the map. Click the X to the right of the draw icons to clear the drawing and start over. File Geodatabase (.gdb): A file which can contain several types of data; used in ArcGIS and QGISIf you have raster data on your map and you are downloading by area of interest, the raster data will be downloaded as well. When you search or browse for data, the Add button will say “Add TIFF”, “Add JPG” or “Add MrSID” for raster data. These are the format that your raster data will be downloaded in. 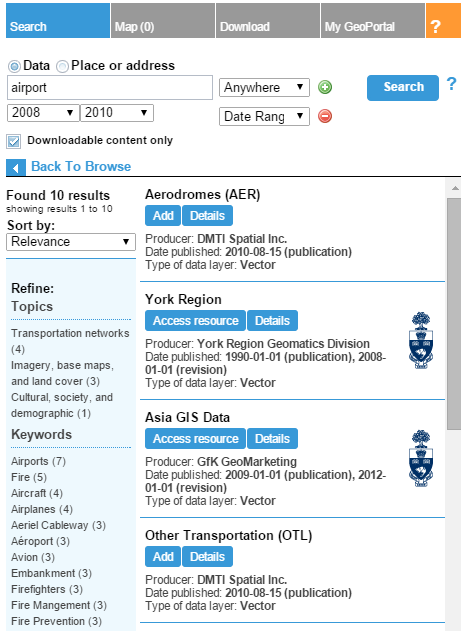 You can also tell what file format your raster is based on the name of the data layer; for example, a layer named “2005 Aerial Ortho-photography Municipal Inventory Mapping – City of Ottawa – tiff” would be downloaded as a TIFF file. The image formats include:TIFF: Highest resolution, but large files. If you will be doing image processing this will be the best choice. JPG: A compressed format. Lower resolution, smaller download size. If your images will be used as a visual aid (base map) this format is a good choice. MrSID: A compressed format. Lower resolution, smaller download size. If your images will be used as a visual aid (base map) this format is a good choice. Requires a LizardTech MrSID plugin to view outside of GIS software. There are many coordinate systems available. Check out the “Help & Resources” page for more information. If you’re unsure, we recommended that you leave the default settings (“Same as Input”), as this will maintain the original coordinate system that the dataset was created in. Raster data cannot be re-projected in the GeoPortal, and will be provided in the coordinate system in which it was created. Click the blue Download button below the list of data layers. Under the download button, “My download list” will show you which downloads are processing and which are completed. When a download completes, you will see a notification in the upper right corner of the screen. Click on the file name in the download list to save it to your computer. You will need to unzip the vector data download before using it.If you download a large area of raster data you may get a warning that your area of interest contains too many images/tiles. You may wish to select a smaller area of interest for your download and try again. For some datasets, you can download them all at once by clicking Download All, but note the download size estimate before you begin and make sure you have enough space on your hard drive as these files can be large. An alternative way to download geospatial data from the GeoPortal is through the use of queries of the underlying data. Data downloaded through this method will be available in Excel (xls), CSV, or Shapefile (shp) formats. For more advanced information about queries in the GeoPortal, check out our guide to advanced queries (PDF). Open the data table by clicking the “Data Table” menu item in the upper right corner. Note the table headings in the top row, which can help you write your query; for example, if we want to find data for a specific province, we would note that the heading for that field in the data is PROV. Click “Query” at the top of the data table window. To return to the data table at any time, click the “X” above the query text box. Enter your query. You can double-click field names to add them to your query, and use the buttons to add operators to your query. If you have more than one data layer on your map, you can use the drop-down menu to select which layer you would like to query. If you would only like to query data based on your current map view, you can click the checkbox for “Limit to current extent”. You will now be presented with your query results. You can double-click a record to zoom to that feature on the map. If you want to download the data from your query, click “Export Result” and select your file format. A notification that the data is exporting will appear in the upper right corner of the data table window. Once the data is ready, your will see a notification in the upper right corner that “Your file is available here”; click that text to go to your download list, and click the file name to download the data. 1. Click on the Map tab and then choose the Map Annotations subtab. 3. Add or Draw the annotation on your map and type a label. Press “Enter” on your keyboard to apply the label. 4. To save the annotation to your map, click the Save or Save As button. This will save your map extent (zoom level, data, and annotations) to your account for you to access later. Base maps are map views that display a collection of geographic data including streets, topography, shaded relief, and more depending on the base map, that can be used as a setting for a map. You can use different base maps in the Scholars GeoPortal by clicking on Base Map in the upper right tool menu. Using the base map window, you can change the base map and adjust the transparency of the map using the sliding scale in the upper right corner of the window. To save a map you created in Scholars GeoPortal to your account, click Save on the upper right tool menu. Note that you will need to be logged in to save and view your saved maps later. You will see a prompt telling you that your map is being saved and will now be available from the My GeoPortal tab. It is also possible to save any download “areas of interest” you added to the map while using the Download tab. Clicking Save will automatically save any areas that are currently showing on the map. Click OK on the prompt and the My GeoPortal tab will now open. Give your map a title, e.g. “Mississauga”. The map is now saved in your account and is available from the My GeoPortal tab whenever you sign in. You can share your Map with anyone by providing the website link (url) for the map view. Select the Share option available in the upper right tool menu. A box will appear with the link to the map; simply copy the link and paste it wherever you would like to share it. Export will allow you to save the map as a file to your computer. An exported map will include a title, legend, north arrow, scale, data source, title, and date. To export, click Export in the upper right menu bar, enter a map title, name or organization, and a file name (if left blank the file will be called “Output”). Select your layout and file format, and click Export.Your map will be available to you for download from the Download tab, in the ‘My download list’. Print will generate a printer-friendly map image in your web browser. A printed map will contain a title and brief description; if you require additional map elements, we recommend using export. To Print, click Print, enter a map title and your name or organization, then click Print.